Today it is rainy and gloomy, the perfect day to edit with my newest fall-inspired texture I call “Good Earth”. This texture looks lovely on so many images! I usually use it in Soft Light, Overlay, Multiply or a combo of those blending modes. Feel free to make it B&W, or even change its color. Tomorrow I am going to post a tutorial on how I edited the bird in the image below. In this edit I added The CoffeeShop Good Earth desaturated texture two times, once in Soft Light and once in Overlay blending mode. Then I added a cream Color Fill layer on top and put it in Color blending mode so that it would be a creamy B&W edit. 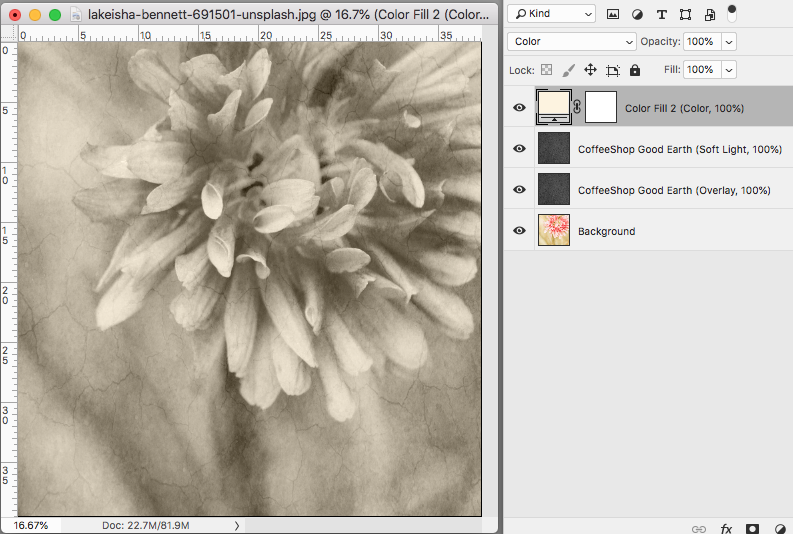 Download the CoffeeShop “Good Earth” Fine Art Overlay/Texture.